Use the Server Settings Performance Warehouse pane to set up connection details to use an external database. Use the external database to store Performance Warehouse data, manage System Profiles, and set the maximum duration for how data is kept. See Performance Warehouse Administration for more information. Cyclic measurement data persists in the embedded Derby database or in a SQL DBMS (DB2, Oracle, PostgreSQL and Microsoft SQL Server). The embedded database is for testing only and its usage is limited to certain licenses. See Embedded Performance Warehouse Usage Restrictions for more information. See System Requirements for SQL DBMS minimum supported versions. You can only change the database when a database is not connected. Follow these steps to change the Performance Warehouse database. 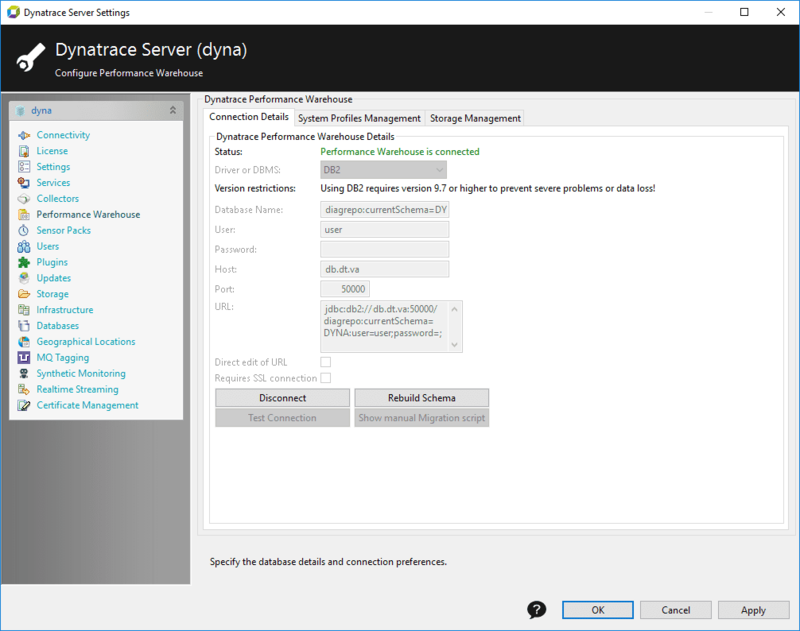 Click Settings > Dynatrace Server > Performance Warehouse > Connection Details and click Disconnect to disconnect the current database. Provide a database type, host, port, user, and password to specify the new database. The Java Cryptographic Extension encrypts the password. Click Test Connection to verify that the Performance Warehouse database is available. Click Connect to connect to the database and create the tables. The AppMon Performance Warehouse is now set up to the configured database. Click the Rebuild Schema to rebuild the whole database schema. When you rebuild the schema, all Performance Warehouse data is lost. See Performance Warehouse Administration for more database connection information. The System Profiles Management tab of the Performance Warehouse pane shows the System Profiles available in the Performance Warehouse. To remove unnecessary measurements or incidents from a System Profile&apos;s Performance Warehouse storage, select a System Profile and click Delete Measurements/Incidents. Click Remove to delete a System Profile and all its data from the Performance Warehouse. Use the Storage Management tab to set the length of time data are kept in high, medium, and low resolutions and when they are consolidated into the next lower level. The data point interval is ten seconds for data in memory and one minute, hour, or day for high, medium, or low resolutions in the database respectively. See Resolution for more information. The Performance Warehouse database continuously stores data from both system monitoring such as CPU and memory usage, and PurePath timings. Data is stored at 10-seconds granularity at the highest resolution. Granularity is diminished at the medium (hour) and low (day) resolutions. Stored session files can contain a memory dump, thread dump, sampling, or full PurePath information. Stored PurePath Sessions also include time series data. AppMon 2017 In the Cockpit right-click your System Profile and select Session Storage > Start Recording. In the Start Session Recording dialog box, give a name to the stored session, and select content to be stored. To stop recording select Stop recording in the same menu. Stored sessions can be found in the Session Storage section of the Cockpit. The Export Session option packs up the stored session into .dts files. Imported sessions are available in Offline > Local Sessions section of the Cockpit. AppMon 2018 April and later In the sidebar, click Settings > Start Session Recording. In the Start Session Recording dialog box, give a name to the stored session, and select content to be stored. To stop recording select Stop Session recording in the same sub-bar. Stored sessions can be found in the Session selector. The Export Session option packs up the stored session into .dts files. Imported sessions are available in the Session selector. What is the Performance Warehouse?